He is China’s number one dissident, described in the press here as a criminal, for others a hero of Chinese democracy. Either way, Liu Xiaobo’s collapsing body is at the heart of a struggle to control the message over the meaning of his fast approaching death. China’s dying Nobel Peace Prize winner is at the centre of an information war. The country’s state-run media say Liu Xiaobo’s cancer “mustn’t be politicised” as they publish leaked recordings of him under surveillance while in jail and now in hospital. International human rights groups say they are dismayed he is still being held under guard to the very end and the German government says China’s security forces are running the treatment of this terminally ill patient rather than doctors. The truth is that the Chinese government knows this all looks bad. Not since Nazi Germany has a Nobel Peace Prize winner died while in custody and that is exactly what is unfolding here. Following a diagnosis of terminal, late-stage liver cancer, Chinese officials moved him from prison to hospital to see out his remaining days under guard but with better medical care. Nobody is doubting the genuine effort of the Chinese doctors who have tried to help Liu Xiaobo nor their professional capability. But the German government says they are not running the show around Liu Xiaobo’s bed at Shenyang’s First Hospital of China Medical University. That has been the job of China’s state security forces. And it has been a show. According to a statement from the German Embassy, when one of the country’s doctors came to help, audio and video surveillance of this meeting was recorded despite prior written German requests that no such recordings be made. Then this material was selectively leaked to Chinese state media in order to get out the message that his treatment had been humane. Liu Xiaobo has been held since soon after the Beijing Olympics in 2008. He was given an eleven-year jail term for “inciting subversion of state power” after he and others co-authored a manifesto called “Charter ’08” advocating a sweeping democratic overhaul of China’s system of government. One of the most risky things you could possibly do in China is promote any form of organising around the overthrow of Communist Party monopoly power. While in custody in 2010 he won the Nobel Peace Prize which was awarded to an empty chair in his absence. 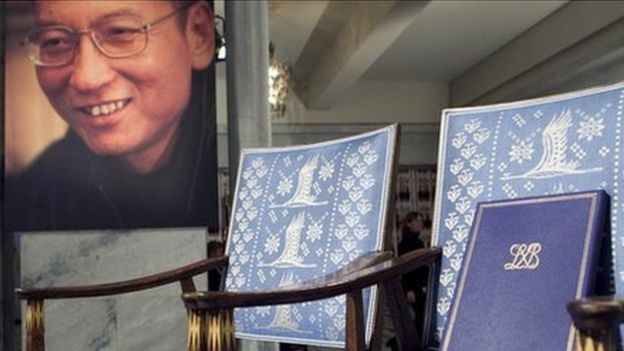 Who is Chinese dissident Liu Xiaobo? In recent times Liu Xiaobo’s health has been deteriorating. Since his cancer diagnosis, Western governments and human rights groups have called for him to be allowed to go overseas for better treatment. Chinese officials have responded that he is too unwell to travel yet two foreign doctors, after visiting the hospital, contradicted this diagnosis. As a compromise, China has allowed two international specialists to come and see him in Shenyang. “Liu Xiaobo and his family have requested that the remainder of his care be provided in Germany or the United States. “While a degree of risk always exists in the movement of any patient, both physicians believe Mr. Liu can be safely transported with appropriate medical evacuation care and support. The Chinese government has not agreed to allow this to happen. Instead it has been releasing footage of Liu Xiaobo appearing to say on camera that Chinese doctors have treated him well and that some of his symptoms pre-date his incarceration. The clip of surveillance footage with the foreign team of doctors achieves the same effect. Liu Xiaobo is shown lying in bed with a small crowd of medical staff and others around him. Dr Büchler is seen speaking to Liu Xiaobo’s wife, Liu Xia, who is standing at the bottom of his bed with her back to the camera. 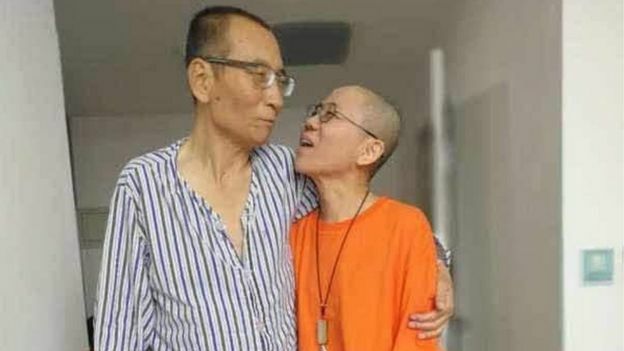 Liu Xia does not reply and must appear distressed because the American doctor says “Are you OK?” as he reaches out to comfort her. When asked about requests that China’s most influential dissident be allowed to travel overseas for medical help the response from the Chinese government has been that this is an internal matter for this country and that others should simply mind their own business. At the regular foreign ministry press briefing on Monday, eight of the 17 questions to the spokesperson were about Liu Xiaobo but, when the official transcript of the press conference appeared on the ministry’s website, all questions relating to Liu had been removed. This is standard procedure for the authorities here when it comes to sensitive subjects. Promote your own line (foreign doctors praising their Chinese counterparts), and shut down all discussion which contradicts it (foreign doctors saying he can travel overseas or German government saying surgeons not in charge of his care). As an exercise I have been asking “ordinary” Chinese people in recent days about Liu Xiaobo. My questions were met with a blank expression – er, who? People do not even seem to know that China has had a Nobel Peace Prize winner. For the Chinese government this represents mission accomplished. As for the country’s reputation overseas they will just plan to ride this one out like they have with other unpleasant subjects.